The SUNY Cobleskill women’s basketball team ended their season on Wednesday evening by losing to the host Springfield College in the opening round of the 2017 Eastern College Athletic Conference (ECAC) Championship Tournament by a score of 54-42. With the loss the Fighting Tigers end their season with a 14-12 overall record while the Pride will now advance to the tournament’s quarterfinal round to be played at Carnegie Mellon University in Pittsburgh, Pa. on Friday March 3rd with a 19-8 overall mark. 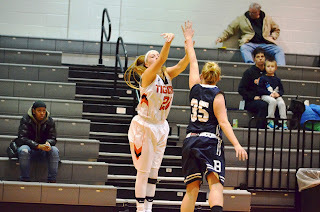 Despite a slow offensive start that saw Cobleskill connect on only 10-of-32, 31.3%, shots from the field, the Orange and Black trailed only 28-26 at the half as their defense held the Pride to an equally icy 10-of-29, 34.5%, shooting from the field while forcing the home team into eight turnovers in the stanza. School/Schenectady Community College, with eight points and four rebounds and senior forward Shelby Preston, Ravena, N.Y., Ravena-Coeymans-Selkirk High School, with seven points and six rebounds did the bulk of the damage for the visitors as the Fighting Tigers answered the Pride basket-for-basket during the half. After the break Cobleskill came our aggressively in the third quarter and took a 31-30 lead with 8:08 left in period when Shelby Preston powered up inside for a lay-up. But from that point on Springfield controlled play outscoring their guests by an 11-to-2 margin the rest of the way to take a 41-33 lead into the final quarter. The fourth quarter proved frustrating for the Fighting Tigers as their defense kept the Pride in check holding them to only 2-for-11, 18.2%, along with forcing four turnovers. However they could not cut into the lead as Springfield came up with five critical offensive rebounds and converted on 9-of-12, 75.0%, of their free throw opportunities down the stretch to secure the victory. Shelby Preston closed her Cobleskill career by posting her 58th career double/double with 13 points and 10 rebounds while freshman guard Addy Lawson, Milford, N.Y., Milford High School, added 11 points, five rebounds and three assists on the night. The Fighting Tigers also received solid efforts from Ashley Creighton with eight points, seven rebounds and four steals and from freshman Shaliyah Graham, Bronx, N.Y., Martin Luther King Jr. High School, with eight points and five rebounds. Zaneski 0-1 0-0 0; Tegan Matthews 0-1 0-0 0. Totals 17-58 4-7 42. College 13. Technical fouls--SUNY Cobleskill-None, Springfield College-None.